In setting up next semester’s “e-PR” unit for students the the University of Notre Dame Australia (Fremantle), I have created a google group, blog and twitter account. The students will use google as a hub to conduct a range of activities, including surveys and blogs. In setting up Twitter I have grabbed some of the peope I’m already following from another account. In an effort to inject more local “content” (more Perth PR practitioners) I searched google for “Perth public relations”. In the first two pages of results, 10 companies were listed (not including paid ads). To my surprise, only two companies mentioned on their web site they had a twitter presence. Given all the hype about the medium as a communications tool, I found this strange. I now feel a survey coming on. But I’ll save it for class. With reputation management a cornerstone of PR, I wonder if they’re risking their reputation by having the bikies as a client? Whatever the effect this will have on the PR company (whose ethics I find hard to fathom) certainly the bikies are spending up big. The campaign they’re running has all bases covered, including a raft of web sites (national and State bodies in NSW, SA, Qld and WA). Some are on Twitter. However, I do wonder why one of the links leads to a gang in Norway. The angle they’re taking is that the proposed legislation, curtailing the right of freedom of association, will affect everyone in the community. Certainly, they have a point. But, as WA Police Commissioner Karl O’Callahan pointed out, it only applies to groups with criminal leanings. Scouts, fear not. Several items on the TV news this week made me wonder whether AUstralian professional sport is heading for extinction. First you had the Socceroos asking for more money when playing for Australia. Given the relatively small financial balance of soccer in Australia, that’s a BIG ask. There’s only so much money you can wring out of a competition that doesn’t really deliver the spectator numbers that equate with wages. I thought it would be enough that the players would be honoured to turn out for their country, rather than make financial demands. The Wallabies were at it, too, wanting to be paid for what amounts to training, for a Possibles versus Probables match prior to their tour of Japan and Europe, complete with a fourth irrelevant Bledisloe Cup match in Tokyo. So the national rugby union players also seem to have lost their pride in the gold jersey. On this season’s performances they are lucky they’re getting paid anything at all. Netball. Last night I watched as some ridiculous international tournament was being played. It’s ridiculous because, it’s always the same few Commonwealth nations that play one another, so it’s boring. But they have now given “fans” a shortened version of the game, the World Netball Series, complete with rolling substitutions, shooting from outside the goal circle and power plays. God help us. Never mind the “world tournament” has only six teams, including those “powerhouse” sporting nations of Malawi, Jamaica and Samoa. Interesting, no South Africa. I’m just not sure where sports watchers can find the energy to watch this too-often-repeated diet of mediocrity. If they’re like me, they have long ago switched off. I’m going for a swim. The number of advertised PR jobs in Australia and New Zealand rose in September. 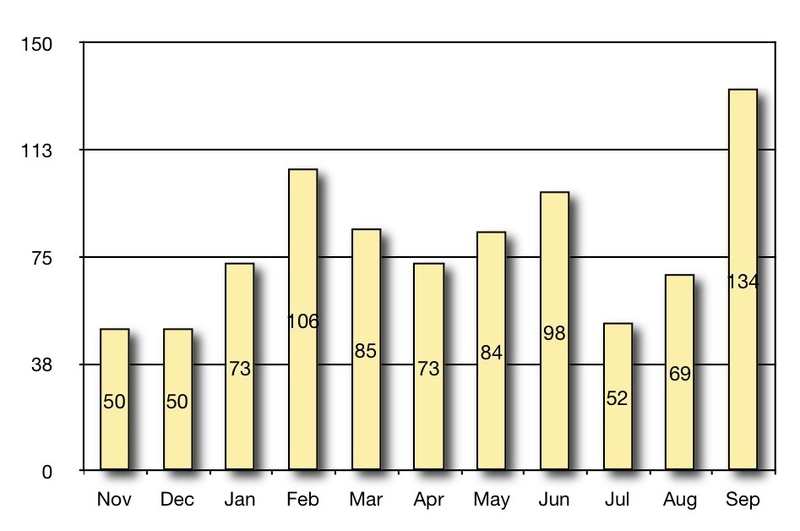 There were 134 jobs advertised, which was almost double that of August, which recorded only 70. The worst period for job seekers was November and December last year and July this year, with only 52-54 positions each month. The increase may indicate that PR reflects what a lot of people are saying about the economy: that it’s picking up. If you’re in PR and looking for work, the best places to be are Sydney (38 per cent share), Melbourne (21%) and Brisbane (16%). The worst places are Perth and Adelaide, with only three per cent of advertised positions. New Zealand, with eight per cent is a better choice. The survey has been running for the past 11 months and looks at fulltime jobs advertised nationally on line by Seek, Career One and Randstad. The decision by the government (via the Department of Defence) not to name 83 Diggers wounded in Afghanistan is a disgrace. So disgraceful is is that on Monday I will tender my resignation from the Defence Force. Defence says it is acting in the interests of the soldiers: protecting their privacy. Well, that’s the spin, isn’t it? The real reason for the cover-up is the government doesn’t want the public to know about the injuries. There’s an election due soon. It doesn’t take a genius to know what the continual reporting of battle casualties will do for for Rudd’s popularity. As reported on today’s front page of The Australian, this is at odds with the wishes of soldiers serving in Afghanistan. They want the public to know the truth. Their view is backed by former Chief of the Defence Force, Gen. Peter Cosgrove, and Lt. Col Dave Lewis, from the SAS Association. I’ve spent 23 years in Army PR (for of them in the Regular Army) and served in East Timor in 2001. Sorry to say that ends on Monday.